We spent a couple of weeks in the South of France in May into June with the family so decided it had been a few years since we spent any time in the North West of France and given the good summer weather with the promise of a good autumn we set off in early September to spend 3 plus weeks exploring and re-visiting old haunts. Having researched the usual ferry crossings I was surprised to discover that the Caravan Club overseas booking service were offering the best deals – by far. Not only were they the cheapest price but also included 4 overnight stay vouchers valid for two years. These each cover one nights stay at one of the many hundred sites listed in their overseas book for two people, caravan (or motorhome) and car and include EHU. Another small bonus is that you can amend your dates for a £10 admin fee – plus any differences in crossing fares. I reckon we saved over £200 in comparison to the best deal I could get by going to the ferry companies direct (if you include the vouchers worth around £90) We also took out the ACSI membership for under £10 from the CC and this also more than paid for itself during our trip. We sailed from Poole on the 4th Sept for a very smooth crossing to Cherbourg, having traveled down to Poole on the previous day staying on the Ferry car park alongside many other travelers overnight ready to board at 7.30 am in the morning. I must add that we had a terrible journey down from Beckingham on the 3rd taking almost 10 hours to cover what should have been a 4 to 5 hours. Maybe we need to look at alternatives next time. We arrived at Cherbourg around 14.00 hrs local and were soon on our way. We had decided to stay for 2 nights at the Camping Belle Riviere outside Nantes. 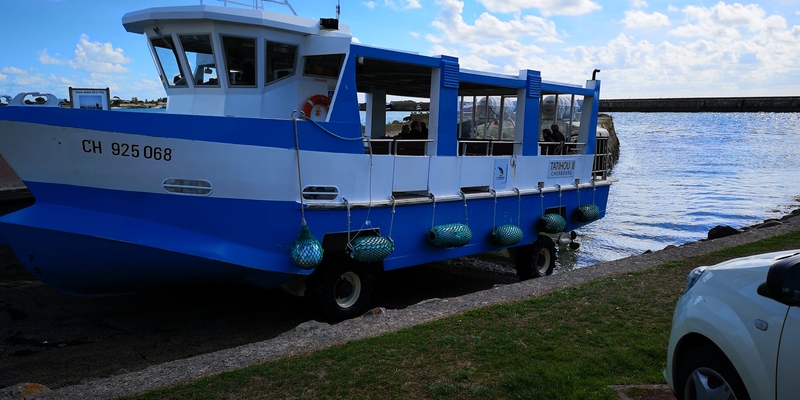 We hadn’t booked in advance as we didn’t know exactly when the ferry would dock, what the road traffic would be like and we didn’t want to arrive in the dark. After a trouble free journey we arrived at Camping Belle Riviere just before 6.30 pm and were all pitched and settled by 7pm. We were surprised to find the site was very busy with most pitches occupied. Having stayed here previous years we knew we would get on as they have a large overflow field and that rarely gets full. We decided on a leg stretch before dinner and took a short walk along the banks for the Loire on a very pleasant warm evening. The following day we had planned to walk into Nantes and then catch a local bus back to the site however having researched the bus service we discovered that by walking from the bus stop back to camp would have given us a total of at least 15kms excluding any walking around Nantes – so plan B came into effect. Plan B was to cycle into Nantes park up the bikes, do our sightseeing bit and peddle back. This we did and included a pleasant lunch in Nantes while watching the world go by. 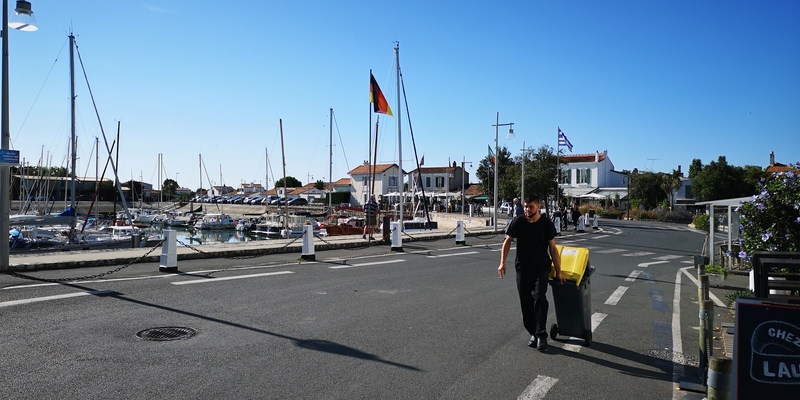 Following our pleasant stopover in Nantes we made our way on to the Ile de Re and spent a week cycling around the island visiting old and new places. The weather here was excellent with long warm sunny days. We met up with our long time friends Chris and Dave and spent our days looking around. This involved us cycling to various towns/locations while Chris and Dave drove there as Chris was suffering from a bad back and found it hard to walk long distances. She did manage one or two walks into Ars-en-re though and we managed a few coffee stops and a lovely Sunday lunch. We also met their new arrival Bertie. Bertie is a King Charles Spaniel and a real cutie. We love cycling around the numerous cycle paths on Ile-de-Re for several reasons – first its flat, secondly the paths are mainly tarmac and although quite busy they are mostly traffic free. 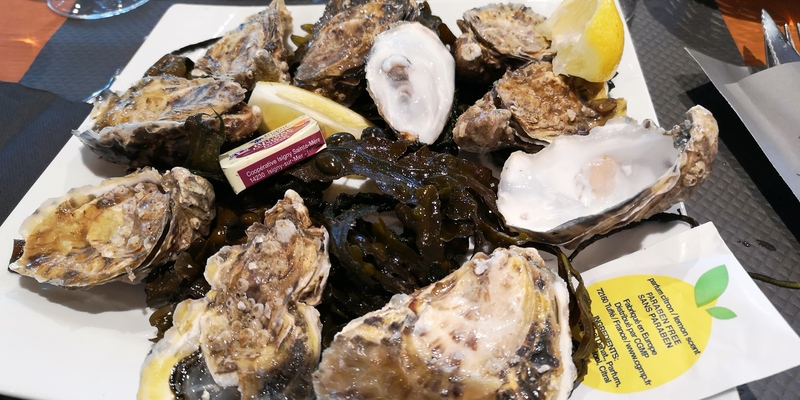 In my case they just happen to have many oyster farms dotted around – naturally we have to stop and taste these wonderful things while drinking a glass of the local wine. We stayed at the Camping du Soleil – not the best location on Ile-de-re but friendly and well equipped. Here we used our ACSI card and saved more than the cost of buying the card. To have booked the site direct would have cost €25 per night but with ACSI we paid €17 all in saving a worthwhile €56 in the week we were there. From Ars-en-re we travelled to a new to us area – the Gulf de Morbihan with Vannes at this head. We stayed at the Conleau campsite and can highly recommend it. We originally planned to stay 3 nights but in the end extended to stay 7 nights as we found the area extremely interesting. 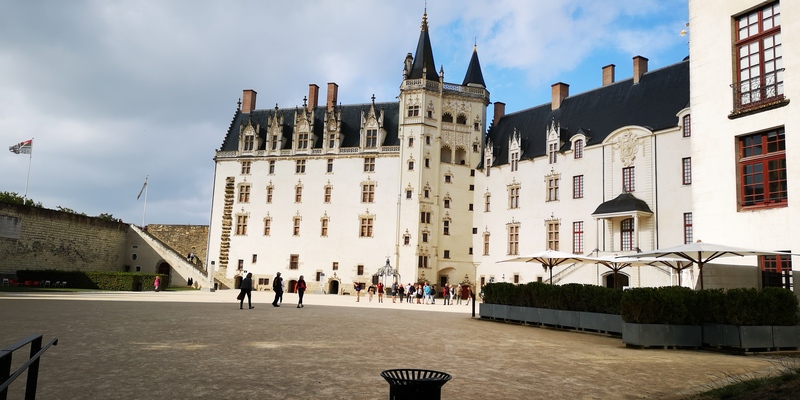 We did a combination of bike riding and walking in the area and managed to visit many of the local tourist areas such as Isle d’Arz and the Sene peninsular. We were really impressed with the campsite as it was so well located for Vannes and surrounding towns. 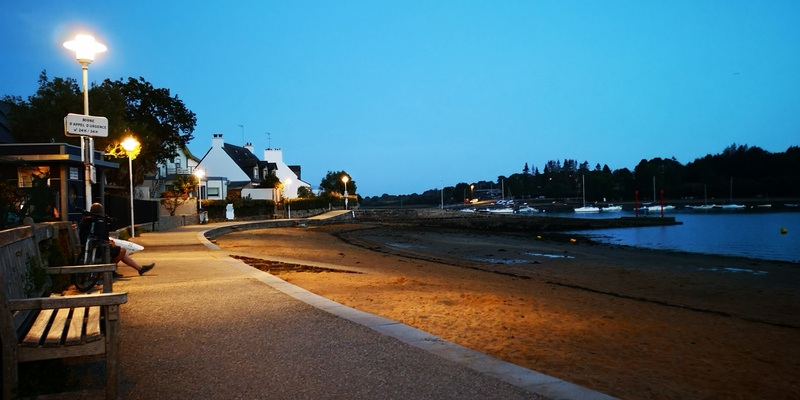 We especially liked our evening strolls around the Conleau peninsular – even after a strenuous walk/cycle. It was so peaceful and relaxing. 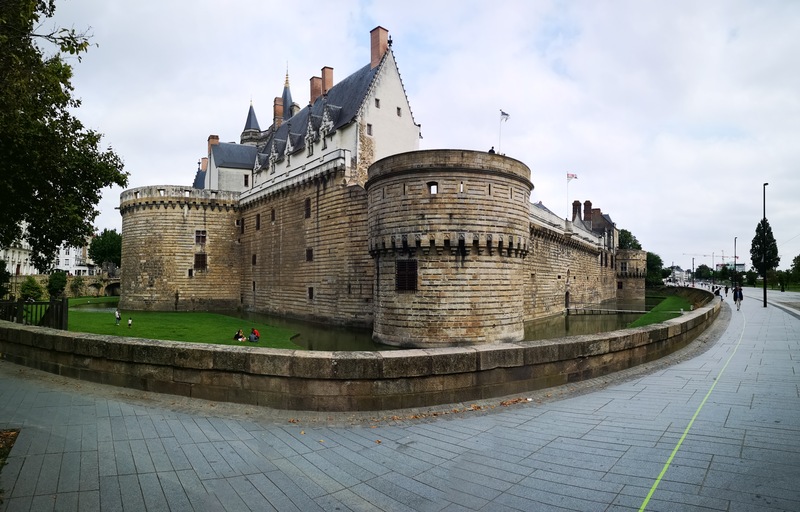 We made several trips into Vannes and found it fascinating walking around the old town. The old Chateau has wonderful gardens (kept in good order by the council) however it is sad to see that the building itself is derelict – such a shame. The market square and market was really bustling and a great place to sit outside and people watch. The old town quay was also a good place to picnic while watching the coming and going of the visiting yachts. We rather reluctantly left our Conleau campsite as we enjoyed the area especially our evening walks around the peninsular (and because the site was closing for the season the next day – even though it was pretty full) Another ASCI site that delivered on price. 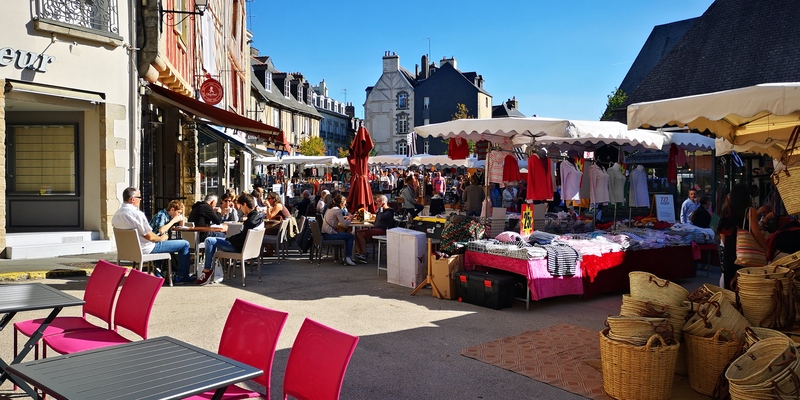 We moved North to St Bruiac and booked into a site that stated “within easy walk into the town centre” however that was a stretch of the imagination. We were disappointed with St B for a number of reasons. First of all it was quite a way from the harbour, secondly there didn’t appear to be a single road that wasn’t dug up and undergoing modernisation. Thirdly it rained. We had booked in for 4 nights but left after 3 as the weather looked set to stay unsettled. 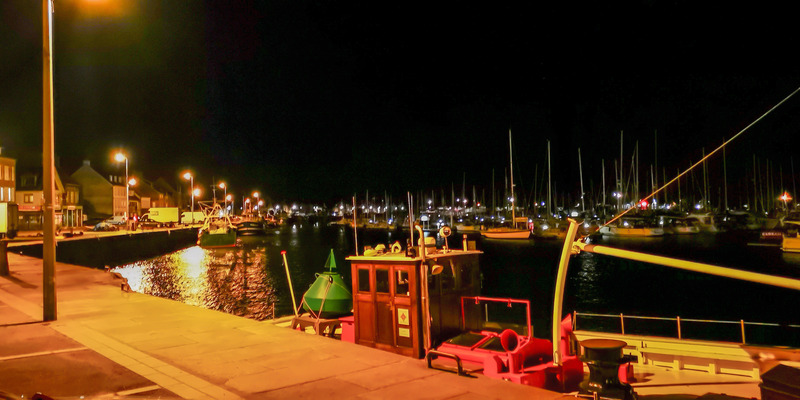 We moved North again to an old favourite of ours St Vaast de Hoogue on the eastern side of the Cherbourg peninsular and only a short drive to the ferry terminal. There is always something new do do here and the weather turned really nice and sunny once again though it was starting to turn cool in the evenings. We did a few more walks around the town and visited the Tower – we even circumnavigated the tower but couldn’t explore inside as it was closed for repair work. We spent our last night at a local restaurant we have frequented before and had a great dinner with oysters, mussels etc. and staggered back to the caravan to prepare for our last leg home. The return journey was no better than our outward journey being dogged by traffic jams and roadworks but we did manage to get home before dark. Another very successful holiday.